Some Democrats and their advocates in the press have been quick to denounce the RAISE Act, the new immigration reform bill proposed by Republican Sens. Tom Cotton and David Perdue and endorsed by President Trump. "The Trump, Cotton, Perdue bill is rooted in the same anti-immigrant, xenophobic, and isolationist rhetoric that was a cornerstone of the Trump campaign," said senior House Democrats John Conyers and Zoe Lofgren. "A xenophobic half-measure," added Rep. Ed Markey. "A play to the xenophobic sentiments that lifted Trump to the presidency," wrote the Washington Post's Jennifer Rubin. Now, though, a new poll shows broad public support for some of the bill's key provisions -- support that goes far beyond those Americans who voted for Donald Trump. The poll, from Morning Consult-Politico, asked 1,992 registered voters about the bill's provisions to 1) allow more high-skilled, and fewer low-skilled, immigrants into the country; 2) install a points-based system by which prospective immigrants would be evaluated on the basis of English proficiency, level of education, and other factors; 3) cap the number of refugees allowed in the U.S. each year; and 4) reduce the total number of immigrants given legal permanent residence in the country to 500,000 from the current one million. The pollsters found strong majority support for the first three, and a plurality of support for the fourth. When asked if they support "placing greater emphasis on an applicant's job skills over their ties to family members in the U.S.," 56 percent of respondents said yes, while 31 percent said no and 13 percent did not know. When asked if they support "limiting the number of refugees offered permanent residency," 59 percent said yes, while 31 percent said no and 11 percent did not know. Finally, when asked if they support "reducing the number of legal immigrants by one-half over the next decade," 48 percent said yes, while 39 percent said no and 14 percent did not know. "Large majorities of Americans have long wanted to re-orient our immigration system toward high-skilled workers, while reducing or holding steady the total number of immigrants," Cotton said in a text exchange recently. "The RAISE Act respects this popular consensus, unlike past efforts at immigration reform that failed in part because they massively expanded unskilled immigration." Cotton appeared to choose his words carefully when he wrote "reducing or holding steady the total number of immigrants." The part of the bill that would cut the number of legal permanent residents from one million to 500,000 per year is the one major component that doesn't have majority support in the poll, although it has more support than any other option. In the weeks and months ahead, the bill's sponsors could either try to build support for that provision or compromise on the total reduction. 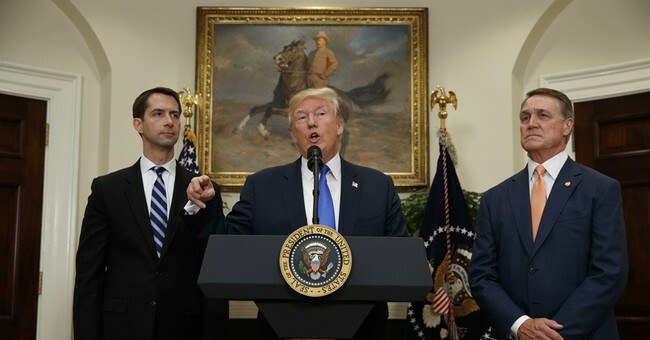 The Cotton-Perdue bill has of course been slammed by Democrats, but it has also been criticized by the Republicans who wrote the Senate Gang of Eight bill in 2013, the last (unsuccessful) effort to pass comprehensive immigration reform. "I don't want to limit legal immigration," Gang of Eight member Marco Rubio said recently, predicting the new bill will not pass the Senate. Fellow Gang member Lindsey Graham, from South Carolina, said the bill would be "devastating to our state's economy." John McCain, another Gang member, opposes shifting to a high-skilled immigrant force. "I think you have to consider that we do want high-tech people, but we also need low-skilled people who will do what Americans won't do," McCain said. And the final GOP Gang member, Jeff Flake, who describes elements of the Republican Party as xenophobic and anti-immigrant, said the new bill represents "the wrong direction." Such opinions track those of many Democrats, which will make any path forward in the Senate an uphill climb. But if the new poll is correct -- and it is in line with similar surveys going back years -- the bill's authors have the voters on their side.